One of the main characteristics of an It bag is an epic waiting list, and the Tara Zadeh Azar clutch might be all over our Instagram feeds, but good luck finding one. The spherical clutch bags have a statement strap with a gold circle and triangle detail and are to be worn looped over the wrist. This circle bag is as distinctive as a Mulberry Alexa or Simon Miller Bonsai, which, combined with a firm following of influencers, makes it one of the year's biggest It bags. Browns' accessories buyer, Hollie Harding, hunts out It bags as a career, and she told me that if she had to pick one key bag for 2018, it would be this. We are such big believers in this bag that at London Fashion Week, we threw a party with Tara, which involved a lot of Boomerangs with the Azar. Keep scrolling to see how influencers are wearing their Azars, and shop the only one we found still in stock. 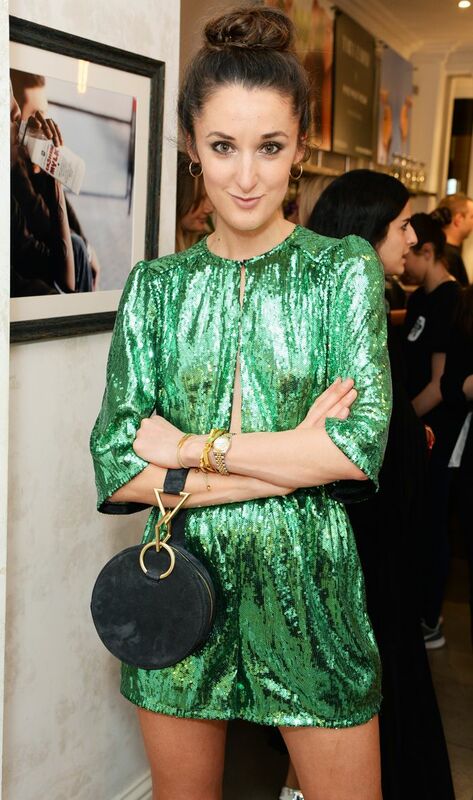 Rosanna Falconer shows the black bag goes perfectly with statement sequins at the Who What Wear x Tara Zadeh party. We love Soraya's lavender version of the Azar, which adds personality to jeans and a T-shirt. This bag has been a regular feature in recent street style photographs. Eleonora Carisi's red Azar looks amazing with polka dots and denim.